Expand Your Horizons for Winning Ideas – StratGo Marketing. Plug-in marketing department services. What’s the marketing connection between Netherlands lingerie, Brazilian hamburgers and US chicken? Dutch company Lingerie Totaal created a clever online, interactive promotion that helps guys get just the right stuff for their wives/girlfriends. It’s tame in terms of international marketing, where companies can push the boundaries that we’re accustomed to here in the US. What really stands out for me, though, is the strong marketing that underpins this effort. The Kliktease idea reveals a deep understanding of consumer behavior, both for the woman who wants her lingerie gift, and for her sometimes shy, confused man who doesn’t know how to proceed. Next stop is Brazil, where Burger King devised a cool, personal marketing “Whopper Face” promotion that directly tied to and reinforced the chain’s famous “Have it your way” positioning. Using a hidden camera and printer, unsuspecting customers had their pictures taken while placing their orders, which were then printed on their food item wrapper. Needless to say, there were some surprised reactions. 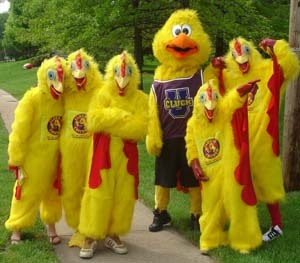 And then there’s the Cluck-U chicken. Yes, that’s right. Headline For Marketers: Cast your idea net far and wide for inspiration that can help drive your business. Make sure that your promotions tie to your marketing strategy and positioning. Sometimes, consumer insights can point the way forward. Other times, leveraging technology can do the trick. Or, it may even be the case that some plain old P.T. Barnum is the answer.